› DIY Printing Tips › Door Hangers › What are printable door hangers? What are printable door hangers? Printable door hangers are created from blank door hanger stock that you print using your own computer and printer. You can create a custom door hanger from a blank template or start with a pre-designed template. 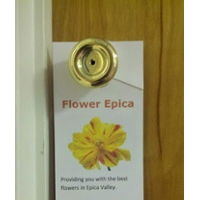 You can print your own door hangers on white paper to show off graphics or photographs. 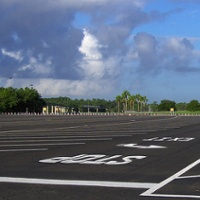 Or, use color or bright color door hangers to stand out and minimize ink costs. Buying blank door hangers is cost-efficient because you can save money by buying in bulk and customizing each door hanger as you need them. Print a few or a few thousand at a time. Why should you make your own own door hangers? What formats are blank door hangers available in?